In what will distinguish the company and the union as the lead donor for the project, Ford Motor Co. and UAW-Ford have announced plans to make a $6 million investment in the Detroit-based Motown Museum’s $50 million expansion. The Motown Museum is a nonprofit organization that aims to preserve, protect, and present the Motown story. Expansion plans to the museum, which were announced last month, will include the addition of new interactive exhibits, a performance theater, recording studios, a larger retail area, and meeting spaces. The new 50,000-square-foot Motown Museum will be designed and built around the current museum space and Hitsville U.S.A. house, located at 2648 W. Grand Blvd. “The enhanced museum will not only upgrade the visitor experience, it also fits with our commitment to investing in the cultural heritage of Detroit and southeast Michigan,” says Joe Hinrichs, president of The Americas at Ford, who will hold a leadership position as part of the expansion efforts. With the Ford and UAW-Ford investment, the expanded Motown Museum will include a Ford Motor Co. Theater; educational, music, and other programming tied to Ford’s ongoing student and community outreach initiatives; a CARaoke Experience, in which visitors take part in an interactive Ford-branded activity that incorporates music with Ford vehicles; and Ford will be the official vehicle of the museum. 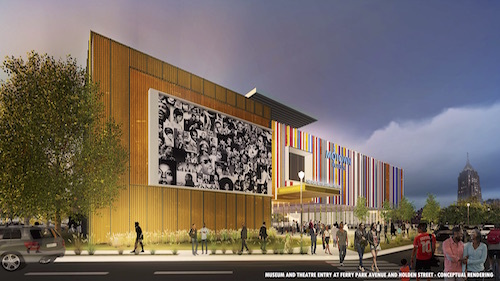 “As the lead donors and committed partners in our vision, their support will help us bring a first class destination to Detroit and the world, and will ensure that this important musical and cultural legacy is preserved and positioned to inspire the next generation of creative and innovative minds,” says Robin R. Terry, chairwoman and CEO of the Motown Museum. The commitment is part of an additional $10 million Ford and Ford Fund, the company’s philanthropic arm, are contributing to Detroit over the next five years. Ford and Ford Fund are investing $20 million in local educational and community programs for 2016. Over the last 10 years, Ford and Ford Fund have made community investments totaling $161 million in the region.